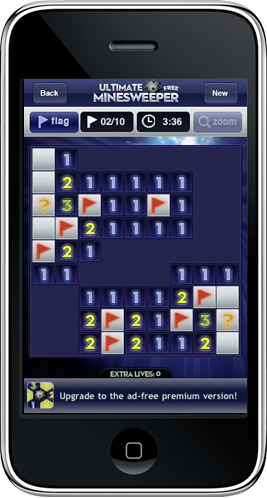 We’re very excited to announce the release of our latest game, Ultimate Minesweeper. Just about everyone has killed time playing Minesweeper at some point in their life. Ultimate Minesweeper adds a new dimension with leaderboards provided by OpenFeint that let you compete against other users from around the world. OpenFeint user Oafdog has already thrown down the gauntlet with an incredibly fast time of 13 seconds to complete the easy difficulty level. See if you can beat that! Download Ultimate Minesweeper today and give it a shot!